The Everyday Skirt sure is a popular pattern. Whenever I’m looking through #lieslandco on Instagram I see a ton of them! It’s been available in digital format for a couple of years, but earlier this year it came out in paper for those of you who prefer that. We love what Karyn did with this pattern and she is here to give us the scoop. Did the Fabric work well? The fabric worked really well. The cotton lawn is lightweight but slightly crisp. It’s great for warmer weather but I’ll keep wearing it into the fall. How did the sewing go? 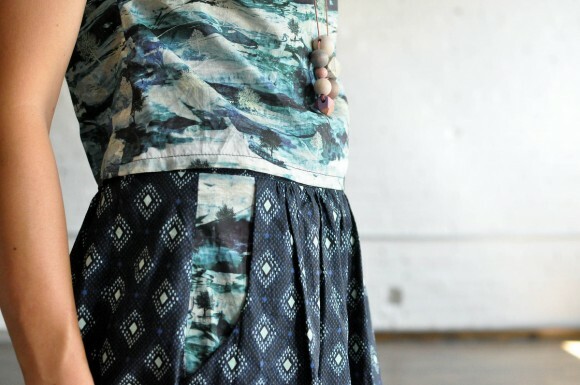 The Everyday Skirt is very straightforward to sew and the construction is clever. I found the directions easy to follow. This is a great pattern for someone new to sewing and super satisfying for a seasoned seamstress, like me. What was the best part? The two details I enjoy the most are the contrast pocket where I used a piece of Liberty. I did make a slight alteration to the pattern here so that the contrast fabric would show a bit more. I also love the double line of elastic sewn only into the back. It’s very comfortable and much more elegant to have the elastic only sewn into the back of the skirt. I really appreciate thoughtful details like that in a pattern. If you are looking for more fabric and style inspiration for the Everyday Skirt, then head this way. This looks fantastic! Thanks for sharing it, Karyn. Nice skirt, interesting details, perfect look! I hadn’t really noticed this pattern before until I saw Karyn’s version. I love this fabric and now I have to buy the pattern. Do you think a novice sewist could grade the pattern up 2 or 3″ in the waist and 4 or 5 ” in the hips? I love your patterns but I’m bigger than your biggest size. I think you could cut the pattern so the fold lines on the front and back pattern pieces are an inch or two from the actual fold line on the fabric and you’d probably be ok. Just pay attention that you’re adding the same amount to front, back, and waistband. Thanks for the help. I’m going to give it a try and see what happens!